David Evans grew up locally in Northern Idaho and Eastern Washington and Oregon. He completed his undergrad and master’s degree in biology at Western Washington University, and also received his Ph.D. in Botany at Washington State University. Evans is a professor and the Associate Director for undergraduate studies here at WSU. Evans also directs the Stable Isotope Core Laboratory, and has been working at WSU for 16 years now. Before teaching at WSU, Evans was a professor at the University of Arkansas for 9 years. 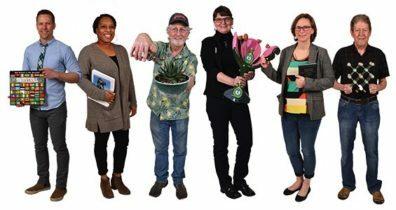 He knew that he wanted to be a professor while he was completing his Ph.D., “I really enjoyed the research, I had a great professor that really got me into plants,” Evans said. Evans research is mainly focused on carbon, nitrogen and water dynamics in terrestrial ecosystems. He has done an abundance of work as a desert ecologist, with global change at the center of his attention. His two main projects currently concentrate on atmospheric deposition in the environment. Evans couldn’t express enough for undergraduate students to reach out to their professors, and graduate students as well. 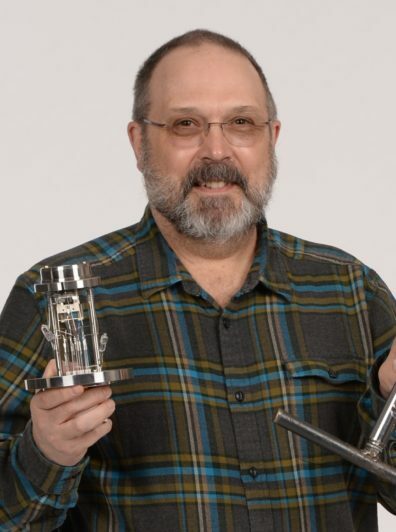 Washington State University’s Franceschi Microscopy and Imaging Center has acquired a microscope so powerful and versatile that Michael Knoblauch, the center director, compares it to a pig capable of making wool, milk and eggs. Or, to quote his native German, an eierlegende Wollmilchsau. Technically, it’s an Apreo VolumeScope, and it brings a suite of imaging techniques, including the piecing together of detailed three‑dimensional images with a resolution of 10 nanometers, or about 1/10,000th of the width of a human hair. The device also uses other techniques that can help analyze the composition of materials and map crystal structures. The combination of cutting‑edge features is unique in the Inland Northwest and fitting for a facility serving scientists from fields as diverse as microbiology, human biology and zoology, plant biology, physics, geology, material and food sciences, chemistry and others, said Knoblauch. The $888,000 machine, funded in part by the M.J. Murdock Charitable Trust, arrived on campus in early November. It will be ready for users on March 1, with a couple months of instrument time already lined up. 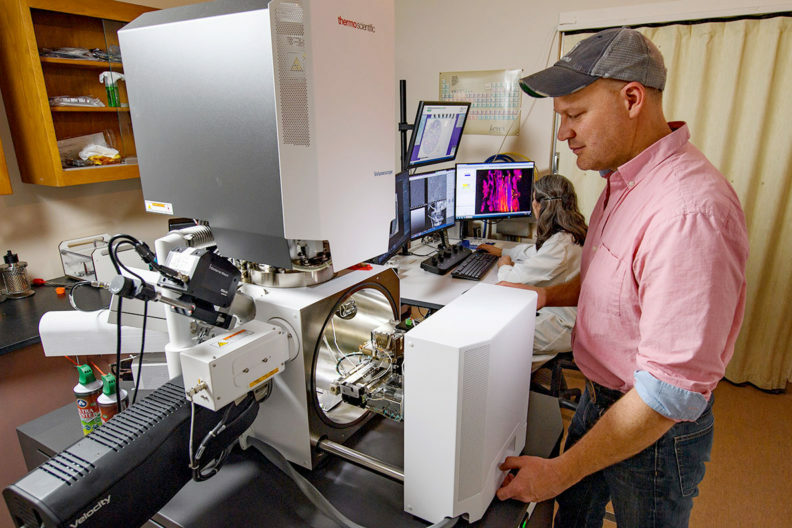 It will supplement the center’s FEI Quanta‑200 scanning electron microscope, a center workhorse that over the last three years was used by nearly 100 research groups for almost 9,000 hours, or 57 hours a week. The VolumeScope’s 3D reconstruction feature “allows identification of subcellular structures at unprecedented detail for life scientists,” according to the center’s grant application. A scanning electron microscope captures two‑dimensional images of a specimen, and a superfine knife, or ultramicrotome, shaves off ultrathin sections between images. The images are then stitched together for viewing in three dimensions. Energy dispersive spectroscopy, or EDS, measures the x‑ray spectra‑light wavelengths unique to different elements—to identify and map the chemical composition of samples. In its so‑called “high‑vacuum mode,” the VolumeScope’s resolution is as low as .8 nanometers, less than a billionth of a meter and an improvement over the previous resolution of 1.2 nanometers. That’s approaching the size of just a few atoms. A third technology, electron backscatter diffraction, or EBSD, can map the crystal state of a material. This is important for determining the quality of materials like alloys, Knoblauch said. “I wish I knew earlier on that one’s life can really take any shape, and that this is up to each and every person to figure out,” says Dr. Jeremiah Busch. 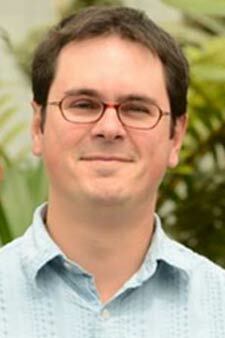 Dr. Jeremiah Busch is an associate professor for the Washington State University School of Biological Sciences, who’s main focus is on plant evolutionary genetics. Busch is particularly interested in traits that have an outsized impact on evolution, and has a long-standing interest in the degree to which evolution closes doors for future evolutionary responses. A lot of his work is based on the evolution of genes that cause self-fertilization, and is currently working on the evolution of polypoids. Busch’s interest in plant genetics started when he really got involved with his undergraduate research at Indiana University. He had two mentors that stuck out to him, Dr. Ellen Simms and Dr. Joy Bergelson. Busch also mentioned that he was blown away by the fact that people were so curious about the world and that they spent their lives trying to understand it. He was fascinated the most with statistic classes because that is where he was most out of his element. Busch was born in Alaska, but has lived in Montana, Oregon, Michigan, Wisconsin, and Arkansas. He completed his undergrad at the University of Chicago, and received his Ph. D. in 2005 at Indiana University. Currently being at WSU, Busch would recommend to all students to figure out what they are interested in, and to get involved in that. “Enmesh yourself in a healthy social fabric too – this helps to strike a proper balance between the rigors of the classroom and the rest of your life, which should be equally rewarding,” Busch mentioned. Genes and other genetic variations that appear to be involved in cancerous tumors shrinking in Tasmanian devils have been discovered by Washington State University scientists. 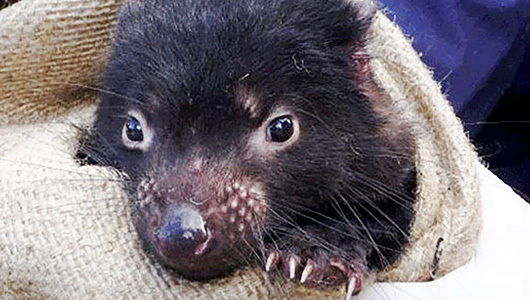 The research is an important first step toward understanding what is causing devil facial tumor disease — a nearly 100 percent fatal and contagious form of cancer — to go away in a small percentage of Tasmanian devils. Indirectly, it could have implications for treating cancer in humans and other mammals as well. Tasmanian devils have been pushed to the brink of extinction by the rapid spread of devil facial tumor disease, one of only four known forms of transmissible cancer and by far the deadliest. Since it was first documented in 1996, the disease has wiped out an estimated 80 percent of devils in Tasmania, the only place in the world where the animals live. Margres is part of an international team of researchers studying devil facial tumor disease that is led by Andrew Storfer, an evolutionary geneticist and WSU professor of biology. For the last decade, Storfer’s team has been investigating how some Tasmanian devil populations are evolving genetic resistance to devil facial tumor disease that could help the species avoid extinction. A year ago, Storfer’s Australian collaborators, Manuel Ruiz, Rodrigo Hamede and Menna Jones noticed something very unusual while trapping and tagging devils in an isolated region of Tasmania. A very small number of devils that developed facial tumors did not die. Rather, over a period of several months, the tumors went away on their own. “This was very unusual and we wanted to test for evidence of genomic variation that was causing these devils to spontaneously get better” Storfer said. Figure 1 from Margres and Storfer’s paper indicates where tissue samples were collected. They found the devils that lost their tumors had three highly differentiated genomic regions containing multiple genes that are known to be related to immune response and cancer risk in humans and other mammals. The results of Margres and Storfer’s work were published last month in the journal Genome Biology and Evolution. The researchers said the next step in the research is to analyze the tumor genome to see if there are specific mechanisms or mutations there that lead to tumor shrinkage. Tumor regression is not a phenomenon exclusive to Tasmanian devils. While extremely rare, it has been documented in human cancers. Doctors observed spontaneous tumor regression in a Merkel Cell Carcinoma patient for the first time in 1986 and it has occurred at least 22 times since. However, researchers remain unsure of what causes the tumors to go away on their own. Storfer and Margres hope is that developing a better understanding of the genetic basis of tumor regression in Tasmanian devils may eventually enable the identification of general mechanisms underlying tumor regression in Merkel Cell Carcinoma and other human cancers. This research was funded by the National Institutes of Health (R01‑GM126563), the National Science Foundation (DEB 1316549), and the Australian Research Council (FT100100250). Top photo: Tasmanian devils are the largest carnivorous marsupials in the world. SERDP 2018 Project of the Year Award for Resource Conservation and Resiliency for team with WSU Faculty. SERDP 2018 Project of the Year Award for Resource Conservation and Resiliency! Madison Armstrong has spent much of her time experiencing the world through research and scientific exploration. To say that she has been involved in an abundance of research experiences, would be a massive understatement. Armstrong is a senior in the WSU Honor’s College, studying Evolutionary Biology and Ecology, with a minor in Genetics and Cell Biology. 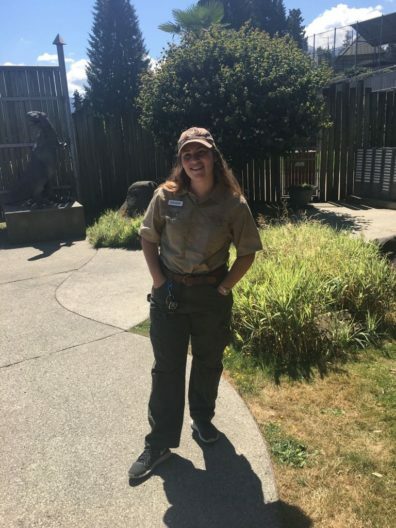 Armstrong started her research experience in Ecuador at age 17, working for “Operation Wallacea,” a conservation company that is based out of the United Kingdom. She met scientists from all over the world that had the same interests and questions that she had. This is where her curiosity and concern for biology started. “I realized that biology could be more than just a favorite class, a job or an interesting topic,” she explained, “it is critical for the success of the planet,” Armstrong said. When she first came to WSU in 2015, she continued to fuel her curiosity by joining Dr. Dybdahl’s lab that focused on clonal population spread. Armstrong began identifying dispersals of clonal lineages of the aquatic New Zealand mud snail. By identifying favorable environmental conditions of clonal types, she found that human dispersal played a large role in the spread of this invasive species. In just her first year here at WSU, Armstrong presented at the 2016 WSU Symposium for Undergraduate Research and Creative Activities (SURCA). Armstrong has also conducted research that focused on phenotypic plasticity of the shell shape in the New Zealand mud snail. She observed that the variation in shell shape occurred across populations of the same clonal type, US1, even though no genetic variation was present. After about a year of research, Armstrong collected data that supported her hypothesis that plasticity played a role in shell shape, which affected snail movement in a self-made flow system. 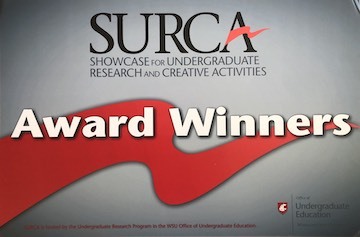 She was awarded 2nd place for her research poster at SURCA in 2017, and attended the National Society for the Study of Evolution Conference in Portland, OR to present her research poster. She then presented at SURCA the following year, and this time was awarded 1st place. 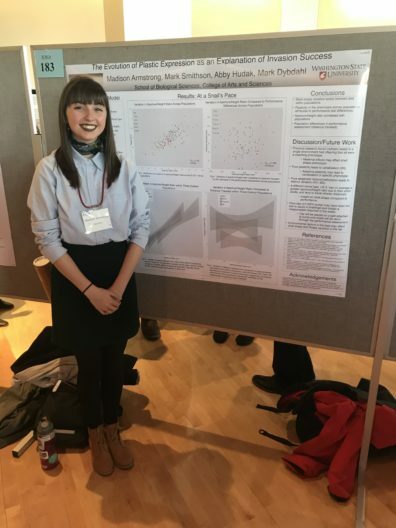 Armstrong was also recognized for an exceptional research poster at a local Evolutionary Biology Conference of the Pacific Northwest region. This past summer, Armstrong attended an intensive week-long computational Bioinformatics course hosted by Physalia in Berlin. She was able to work hands-on with datasets provided from scientists from around the world, and represented the U.S. as the only American in the course. Armstrong thanks SBS and CAS for providing her with funding to conduct research projects for the past four years, and is extremely grateful to have been given the opportunity to pursue her own research questions as an undergraduate student. Washington State University researchers have received nearly $3 million from the John Templeton Foundation, the second such grant in four years, to see if they can anticipate and prevent diseases by developing epigenetic biomarkers that could provide early stage diagnostics for disease susceptibility. Their approach would be a departure from traditional “reactionary medicine,” which treats diseases after they develop, as well as from diagnoses based on an individual’s genetic profile. 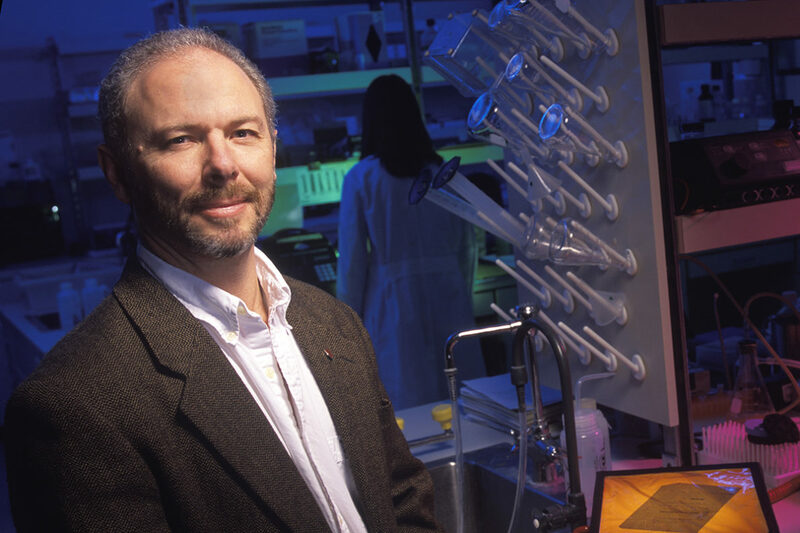 WSU biologist and professor Michael Skinner is the principal investigator on the grant and a leader in the field of epigenetics, which focuses on the molecular factors that regulate genome activity. Lawrence Holder, WSU professor of electrical engineering and computer science and co‑investigator, will collaborate with Skinner using machine learning to help develop predictive epigenetic biomarkers. Skinner has repeatedly identified circumstances in which environmental factors have induced epigenetic activity, affecting health generations after an individual is exposed. His first multimillion-dollar grant from the Templeton Foundation in 2014 supported the investigation of environmental epigenetics as an additional causal factor for disease. Skinner’s research will focus on developing epigenetic biomarkers that might be used to detect one’s susceptibility to disease. The work will in effect be a proof of concept for the technique, which he will first use on autism, the male urethra disorder known as hypospadias, premature birth and congenital heart disease. Students who are dedicated to a profession in veterinary medicine can gain early admission to the College of Veterinary Medicine DVM professional program and become a veterinarian in just seven years. The College of Veterinary Medicine and the Honors College have partnered up to provide an abundance of exceptional opportunities for students over the years. This includes an accelerated seven-year veterinary program through the Honors College. 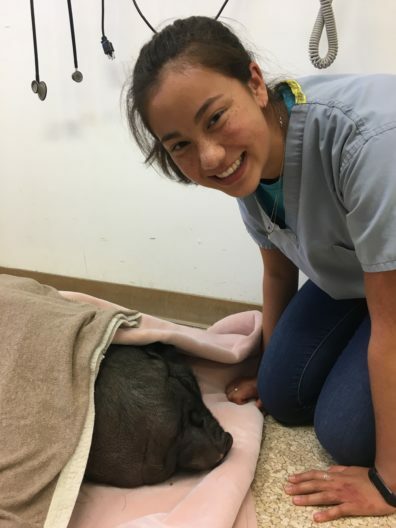 Emily Austin, a WSU sophomore and zoology major, who was admitted to the veterinary program, says that the seven-year Honors Veterinary Medicine program was one of the main factors that drew her to WSU. “It was exciting to think that I could start vet school a year early because I felt I would be ready before four years of undergrad,” Austin says, “and even if I had not gotten in, the experience of going through the application process early in my undergrad career was a great opportunity,” she explained. Students who are interested in this program must apply to WSU and the Honors College as a high school senior. Once admitted, students can choose from undergraduate majors including; Animal Sciences, Microbiology, Neuroscience, Wildlife Ecology, or Zoology. Every summer, the Honors College students who have completed their first year are invited to apply for early admission to the WSU College of Veterinary Medicine DVM professional program. Claire Stein, who is also a WSU zoology major admitted to the program, says that the WSU School of Biological Sciences excelled in preparing students for veterinary school. 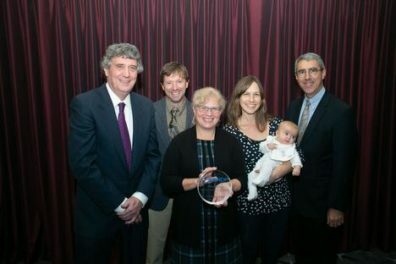 “The faculty in the School of Biological Sciences really care about individual students and their success,” Stein says. “It is really nice to be able to have so many faculty members on your side, rooting for you. It’s been a great experience and the professors have all been incredible,” she explained. For students who want more information about the application process, visit the WSU Honors Veterinary Medicine program website.